Amplifying the coffin motif on their latest release, Death Magnetic, Metallica’s current tour is getting visual life with eight 2-ton lighting structures equipped with 56 Coemar Infinity Wash XL lights. LD John Broderick says the idea was to go for “a more simplified look for the arenas’ rectangular stage-in-the-round.” The audience and performers are lit throughout the shows, and the bright, giant coffins create are part of that. Go check out their article at PLSN. 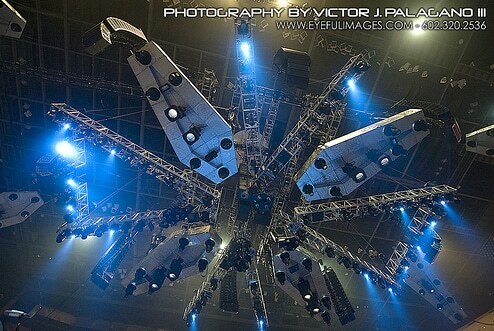 I also found a decent image of the tour’s lighting rig. Give Eyeful Images a look on Flickr.